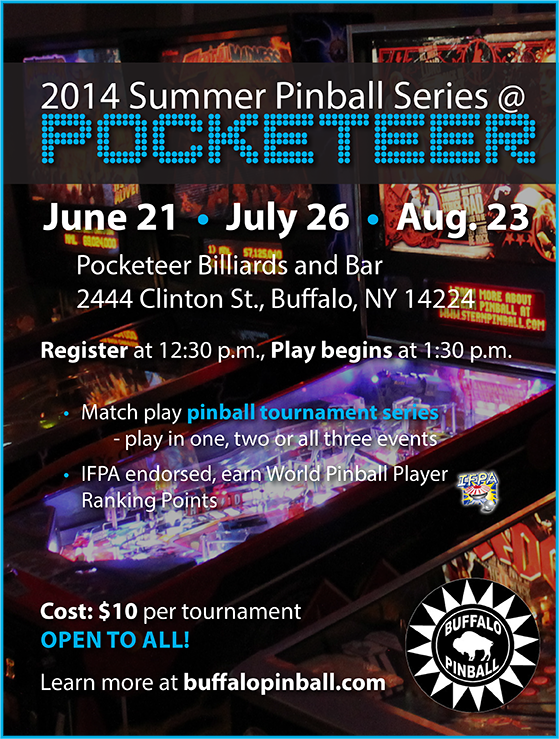 Good news, pinball fans – Buffalo Pinball has arranged for an open, match-play pinball tournament series this summer at Pockteer Billiards and Bar, 2444 Clinton St. in Buffalo! The competitions will take place June 21, July 26 and Aug. 23 and are IFPA endorsed, so you’ll earn World Pinball Player Ranking Points. You can play in one, two or all three of the tournaments. Cost is $10 per tournament, registration begins at 12:30 p.m. at Pocketeer and play will begin at 1:30 p.m. for each event. 100% of the money collected will be paid out to the winners. The number of payouts depends on the number of registrants. Thanks to Pocketeer for hosting and see you there! This entry was posted in Tournaments on May 6, 2014 by k3v2.